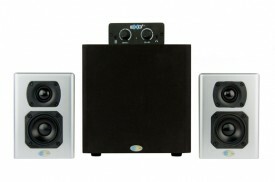 Blue Sky » Blog Archive » New Exo2 Stereo Monitoring System scores 4.5 mice (out of 5) from Macworld! Blue Sky International maker of a number of of professional 2.1 and 5.1 speaker systems, recently released the $500 Exo2 stereo monitor system—an update to the company’s popular eXo 2.1 system, which was released in 2007. The Exo2 includes two good-sized satellite speakers, each 7.2 inches high, 5.0 inches wide, and 4.8 inches deep and hosting a single 3-inch woofer and a 1-inch tweeter; a sealed-enclosure subwoofer, 9.4 inches high, 9 inches wide, and 10.2 inches deep and containing an 8-inch woofer and the system’s amplifier; and a compact “remote hub” (the company’s term) This remote is essentially a small, desktop pre-amp, 4.8 inches wide by 4.0 inches deep by 2.0 inches high, that features pre-amp outputs, left and right XLR/TRS inputs, and left and right RCA inputs on the back; and a 3.5mm stereo input port, a 3.5mm headphone output port, and System Gain and Subwoofer Gain knobs on the front. The Exo2 is designed with the desktop musician in mind—someone mixing his or her GarageBand, Logic, or Ableton Live project at home or in a small studio, for example. However, given the system’s street price of around $425, the Exo2 is also a reasonable choice for those looking for solid sound for their Mac’s media library or stereo AV system. Setting up the Exo2 is simple. Included with the system are two 11-foot speaker wires and an 8-foot cable for connecting the pre-amp to the subwoofer. Just string the speaker wires between the subwoofer and satellite speakers, connect the subwoofer to the pre-amp, establish your audio connections to the hub, and flip the power switch on the subwoofer. (There’s no power switch or button on the pre-amp.) The pre-amp supports three distinct audio inputs: the XLR/TRS connectors for an audio mixer or stereo instrument (a synthesizer, for instance); the RCA inputs for, say playing music from your Mac; and the 3.5mm input for an iPod, iPhone, iPad, or other similar device. (Regrettably there’s no optical input or USB connector.) The three inputs are mixed, meaning you can connect an iPod, a Mac, and a mixer and play them all at the same time. When you plug headphone into the hub, the speakers are muted. You control the subwoofer’s output relative to the satellites using the Subwoofer Gain knob on the right side of the pre-amp. Overall volume is controlled via the System Gain knob on the left. Printed around the edge of the Subwoofer knob are notches indicating suggested starting levels for a subwoofer placed in a corner, a sub not placed in a corner, or a sub well away from a wall. Of course, you’re welcome to twist the Subwoofer Gain knob to any position you like, though cranking it too high when mixing music will likely result in a muddy mix. If you have a normal-sized desk hosting an iMac, a laptop, or a single display, the Exo2’s satellite speakers will fit without seeming to muscle aside everything else on your desk, and the subwoofer is small enough to fit under a desk without risking putting your foot through its front grill. The satellites are designed for near-field listening and sound quite good from just a couple of feet away. The satellites don’t sizzle on the high end as some other small speakers do—while I prefer a little more treble detail than the Exo2 delivers, much more would grow fatiguing. The mids and highs are clear and clean, and it’s only at low volumes that the speakers sound a little boxed in. The bass is as present as you want it to be (thanks to the Subwoofer Gain knob) without getting thumpy. In regard to volume, the speakers are plenty loud, particularly when you’re sitting within a couple of feet of them. You can also fill a small- to medium-sized room with sound though, again, the subwoofer isn’t beefy enough to rattle windows. Likewise, when using headphones with the remote hub I couldn’t turn the volume all the way up without wincing and wishing I hadn’t. Overall, I was quite happy with the Exo2. I spent many days listening to music, watching movies, mixing a podcast and some music in GarageBand, and playing my synthesizer through them, and I was happy with the resulting sound—though, because it’s a stereo system, I did miss having 5.1 surround sound in the movies I watched. Given the option, they’d replace my current desktop speakers, an old Monsoon 2.1 system. The Exo2 2.1 is a solid-sounding desktop speaker system. Given its mission as a desktop mixing solution, it’s also reasonably priced. It’s no replacement for large studio monitors in an equally large studio. Nor is it a particularly good system for mixing certain kinds of club music that demand bass big enough to displace your internal organs. But for a home studio—or on a desktop where you just want great-sounding audio—the Exo2 is well worth considering. See the review in its entirety here.